Last year's 11:11 Ceremony was simply amazing and we were given information during the process that "the ripple effects of what we have begun are beyond our human comprehension" and there is no doubt that our impact through this process ran deep through the timelines. This year, the 11:11 portal falls on a GAP Day, in the way of so many other significant celestial events this year. This GAP Day marks the beginning of a new Wavespell, being that of the White Wind and represents Communicating from Spirit, as well as being designated as Kin 222 - which represents the 'elevated' aspect of 111. For those of you who may not know, 111 is the number of the diamond and 222 is the number Grace and new foundations. "These forces of restoration and renewal are forever present, but in the coming days they’re greatly heightened, reminding us we don’t have to do this alone but instead can garner support from cosmic forces powerful beyond measure. Chiron's trine to the Sun bids us call down healing for our most private selves, into the most intimate places of our lives where no one treads. We each have such a place within: our deepest secrets, darkest shame, most crippling regrets. Their articulation may be beyond us for words cannot express the force of such wounds, nor their impact on our lives. But when the Sun and Chiron align, language means nothing as divine compassion reaches out to sooth a fractured soul"
Grace is the divine emanation of such compassion, and on 11:11, we step through a doorway to help Heal the Tree of Life - personally, ancestrally, planetarily and comsically. We will work at multiple levels with the trees of the planet as well as our personal and inner Tree of Life. In the pre-process webcast, I will share some of the lesser known apsects of the metaphorical 'Tree of Life' and its configurations. 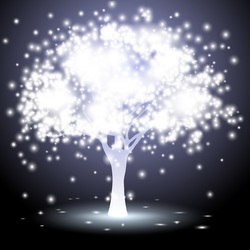 Let Spirit speak on the breath of the White Wind as we join forces to receive, heal, renew and restore the Tree of Life with this cosmic dispensation. "I had a superb Meditation day and at 11.11am we connected to the bridges of white poppies.